I know I love crock pot dishes and Naomi gives us one that looks wonderful for a cold day. What’s your favorite crock pot dish for fall/winter? Naomi says, One of my crock pot “go to girls” is Stephanie O’Dea. I own both of her crock pot cookbooks, Make It Fast,Cook it Slow and More Make It Fast, Cook It Slow. I use both regularly in my crock pot cooking. I am also a big fan of those considered to be in the squash family. When I found this in one of the cookbooks, it was a matter of time before I made it. Now, she said to quarter the squash, but I like mine cut in half. First, it soaks in the butter/sugar mixture so the flavor just explodes when it is bitten into. Second, my husband and I are the only ones to eat the squash so I like the presentation better. On a final note, Stephanie uses salt in her recipe. I am trying to cut salt in my family’s cooking, so I omitted it. I couldn’t tell the difference. 1) Cut the squash in half, and scoop out the seeds and stringy pulp. 2) Put 1 T of butter, 1T of brown sugar and 1 t. into each half. Place the pieces into your crock pot. Cover and cook on high for 2 hours, or low for about 3. 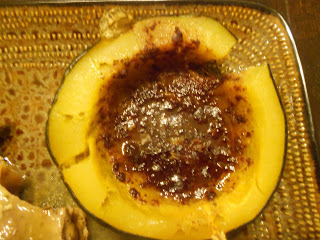 The squash is finished when it is fork tender and peels away from the skin easily.